Due Process and Project Monitoring Bureau is headed by the Director General, appointed by His Excellency the Executive Governor, as chief executive and the accounting officer. The immediate officer under Director General is the bureau Secretary who assists the Director General in the day to day administration of the Bureau. Under the secretary there are seven number (7no.) 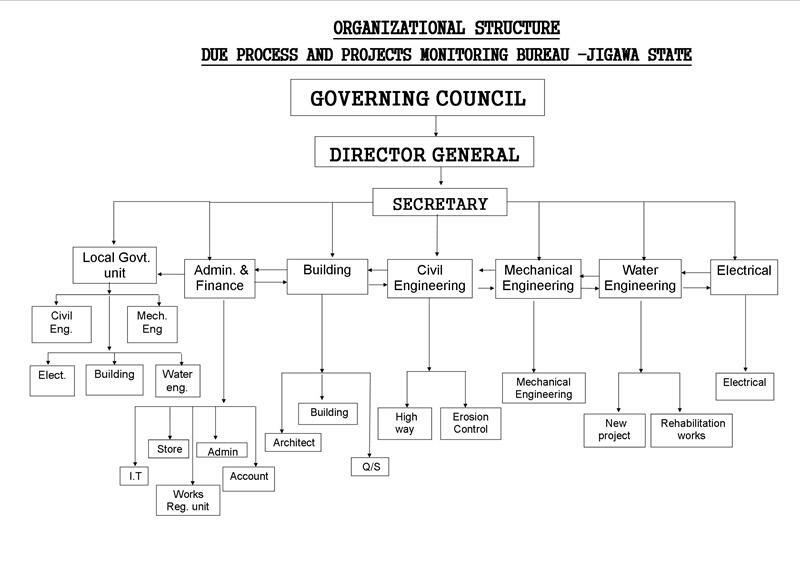 principal officers as directors heading various departments, i.e. Administration and Finance, Building, Civil Engineering, Mechanical Engineering, Electrical Engineering, Water Engineering and Local Government for its effective performance. Under these departments/directors are supporting staff handling additional units (19no.) assigned in accordance with each departments schedule to attain the bureau’s objectives. Presently there are a total of 60no. Staff available within the bureau a part from those deployed to perform a specific function as the need arises both within and outside government. The bureau since it establishment did not execute any capital project rather oversee the execution of project worth-N331 billion over a period of nine years (May 2007 - Dec 2016). List attached.